Carrying on with our Clay Pot themed week, today I made a clay pot bird bath. Again, all this required were some clay pots from the dollar store and some paint! These can be made as elaborate or as simple as you want them to be, and again, clay pot crafts are great kid crafts! The first thing I did was base paint all three pots. I started out just doing a sort of ombre look with them. But when I stacked them to see what it looked like, it was just too plain for my liking so I started painting. I really had no idea when I started what I was planning on painting but I knew it was going to be quick and easy! I started with a little bit of grass at the bottom and that evolved into some little “lollipop” flowers and then polka dots on the top pot? I restacked them to make sure I liked how it looked and then I sealed them. I put a few coats on, just because they will be in my flowerless garden. When the sealer dried I restacked them and used epoxy to attach the bath part of the bird bath to the base of it and that’s it. My little Clay Pot Birdbath! Let us know how yours turns out! Send pics, we will post them to this project post! 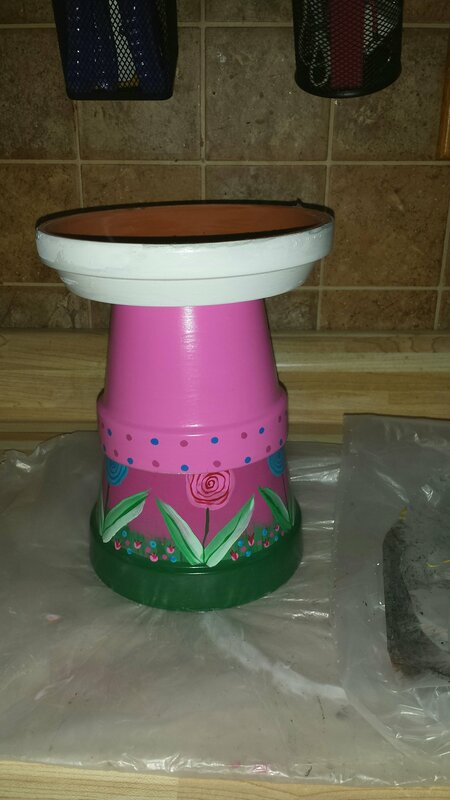 This entry was posted in Crafts, Gardening, Our Posts, painting and tagged clay pot bird bath, clay pot craft, clay pots, easy project, garden art, kid friendly project, postaday. Bookmark the permalink. Super cute! I like the bright cheerful colors – would look so pretty in a flower bed. Considering the fact I am not a very good gardener lol, I thought this would at least add some colour to my garden! Thanks!